How to install Simple Blog PHP? 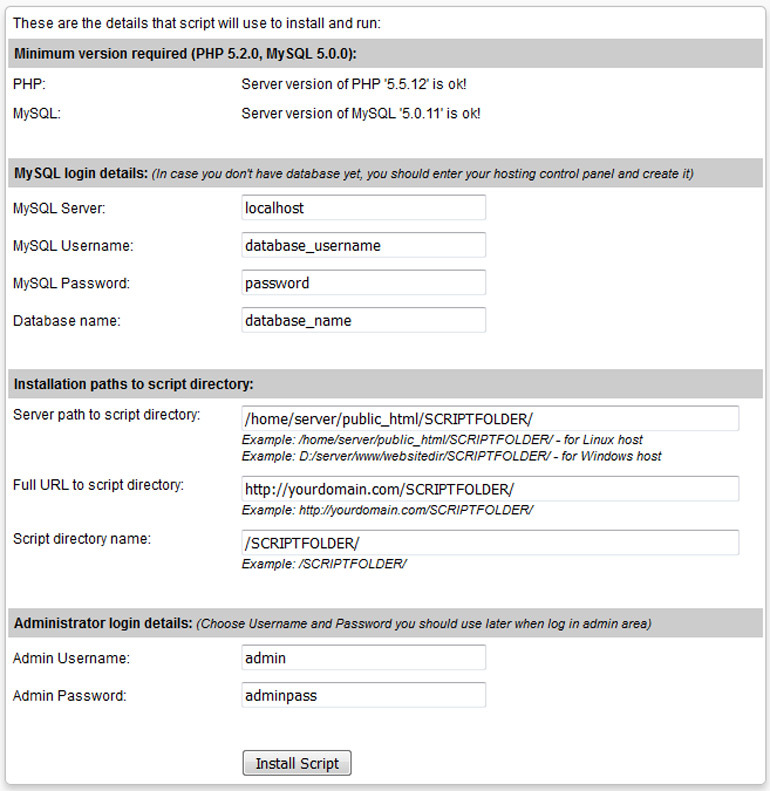 How to use the Simple Blog PHP script admin? Setup css style, setting language, comments options. How to put on the web page. How to install Simple Blog PHP? Simple Blog PHP require PHP 5.3 or higher version and MySQL 5.0 or higher version to run on your server - you can see the current version of PHP and MySQL in the control panel of your website. - Open the Control Panel(CPanel, Plesk or any other) of your hosting account. - Find the Databases section, where you will create a MySQL database. - Durring database creation you will need to supply a Database name, Database user and Database password. You will aslo need to know the database server name — usually 'localhost'. Save all these details on your local machine for future reference on something such as Notepad. - If you use your hosting account's 'CPanel' to create your database you must set Privileges to ALL for the Database user. - If you have problems with creating a database - ask your web hosting company - normally they provide 24h email, phone or chat free support. Also, you may send us an email request and we will create database and install the script on your website. - Unzip the .zip file received from us. You can use programs such as Winzip, Winrar, or Stuffit Expander (Mac). They have all have trial versions. - Next, upload all files to your website. You can either upload the complete folder (for example named "SCRIPTFOLDER") or you can upload all the files individually to a folder you created in the root directory of your website. * note that, you should replace "YOURDOMAIN" with your real domain name and "SCRIPTFOLDER" with the folder you created into the root of your website. Server path to script directory, Full URL to script directory, script directory name - they will appear automatically. You can change if they are different - usually on windows web server. * note, that sometimes the servers does not send correct information about the version of MySQL and a message "Server version of MySQL is not ok!" might appear. The minimum requirements of MySQL for all of our scripts is version 3.0, so if you already created a MySQL database - go ahead and install the script. - Once you click on the link 'Login here', you will be redirect you to the administrator login form. How to use the Simple Blog PHP script admin? After setting the administration options you should click on 'Put on WebPage' admin menu button and choose one of two ways to put the blog on your website. Then copy the code, go to your page and paste between <body>code</body> tags. If you choose second install option you should put this line of code <?php session_start(); ?> at the top of the php page (first line). Also, if you choose the second install option(with php include) you could copy code for the meta title and meta description and paste into <head> section of the html code on your webpage, it will automatically generate meta title and description for searching engines from the title and post text. You can translate the blog front-end in your own language or change the words in the way you wish. In case you decide to use meta tags feature from Admin area -> "Installation" page, you may edit the default meta tags for the blog page from here. *You may even create a list of banned words - Example: word1, word2, word3. So, if some ill-wisher add some comment with any of these words, comment could not be submitted. Also, if you don't find answer of your question, please refer our FAQ section.